To celebrate the launch of Lucky Lotteries on Oz Lotteries we ran a caption competition on Instagram. 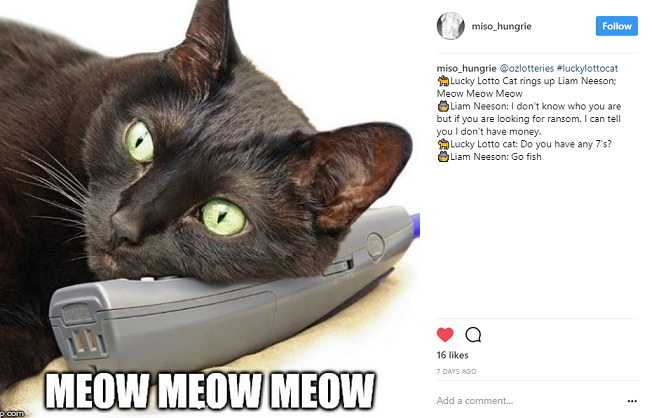 The rules were simple: we asked followers to create the funniest caption for our “black cat on the phone” image, with the hashtag #luckylottocat, to be in with a chance to win $500 cash! We had some great entries, but this is the one that got us chuckling most! A Liam Neeson inspired entry from Q. Truong of NSW, otherwise known as @miso_hungrie on Instagram. When you play Lucky Lotteries you don’t have to share the prize if you win. That includes the jackpot! That’s because individual prizes are won by individual ticket numbers, just like a raffle. When you play Lucky Lotteries you have a choice of two raffle-style draws to enter – Super Jackpot or Mega Jackpot. Unlike other lotto games which have set close times, Super Jackpot and Mega Jackpot close once all available tickets are sold out. When you buy your ticket, you’ll be entered in the draw that currently has available tickets. Results are drawn as soon as the ticket allocation is sold out, so the schedule is subject to change, but you’ll always be notified if you win! Lucky Lotteries tickets start from as little as $2.65 for the Super Jackpot, and $6.45 for the Mega Jackpot. There is no minimum number of games, but the more games you play, the more chances you have to win! When the tickets are sold out, two draws take place. If your ticket number has already won a cash prize in the first draw, and is drawn in the second draw, then it also wins the jackpot! Results then release as soon as the ticket allocation is sold out, so the schedule is subject to change. After the draw, we send you receive an email from Oz Lotteries with details of your ticket results.